Every time I pick a vacation spot, I brace myself; I can count on friends, acquaintances, or strangers who overhear me discussing my trip, telling me what’s wrong with my choice: too dangerous, too expensive, too hot/too cold, too dirty, too far away — ‘You’re going that far for only two weeks! ?’ When I announced my decision to visit Venice for the first time, a cautionary chorus began to chant: “It’s smelly!” “You should have seen it 20 years ago….” “Ah…the canals are full of floating trash!” “It floods!” and, my favorite: “It’s sinking!” (said as if Venice, and yours truly, might disappear into the Venetian lagoon during my trip). I’m an open-minded traveler but I’ll admit when I boarded the plane to Venice, I was apprehensive — could Venice live up to my high expectations? After reading many lukewarm reviews of Eau d’Italie’s new Baume du Doge, I braced myself for disappointment as I opened my sample vial of the perfume. Would Bertrand Duchaufour and Baume du Doge’s enticing mix of ingredients (sweet orange, bergamot, fennel, myrrh, frankincense, cinnamon, coriander, saffron, clove, cardamom, black pepper, benzoin, vanilla, vetiver, cedar) let me down? The romantically named Baume du Doge (Doge’s Balm) opens with rich citrus: fresh bergamot and a deep, almost syrupy, orange aroma. As the citrus burns off, a “cedar chest” opens and I begin to smell a cavalcade of some of my favorite fragrance notes — sweet-scented cedar, frankincense, dry cinnamon, and myrrh. Baume du Doge is evocative of winter and closed spaces: spice cabinets, wooden trunks, and shuttered rooms (where the scents of perfumes, well-used fireplaces and wood paneling and floors mingle); there is no hint of Venice’s canals or sea breezes in the fragrance. Baume du Doge’s notes of clove, cardamom, pepper and coriander are well blended and this mix of spices adds an opulent feel to the fragrance. As Baume du Doge dries down, a cedar-vetiver accord gives way to vanillic notes: a vanilla liqueur aroma turns into benzoin dust. Baume du Doge is a well-balanced fragrance with distinct phases of development: juicy citrus trickles over sticky resins, dry spices cling to moist vanilla, and benzoin incense crumbles to ash. My first glimpse of Venice was not a disappointment. The Grand Canal’s turquoise-blue waters seemed lit from below and the sinking, late-afternoon sun colored the stone palaces pink and purple; cool gusts of wind blew in my face and made me forget my 15-hour flight. Venice was as glorious in person as I imagined it would be. I was so thrilled with the city I felt I was more likely to walk on its waters than sink into them. I wanted to like Baume du Doge because of its Venice “connection;” it can’t compare to the beauty of Venice but while sniffing the handsome Baume du Doge, I can easily imagine a mighty doge — or Venetian trader — savoring the aromas of its exotic ingredients. Baume du Doge fits nicely into Eau d’Italie’s line-up of rich and interesting perfumes (excepting the bland summer 2008 offering: Magnolia Romana — Rome deserves better!) In Baume du Doge, fans of Duchaufour will recognize bits and pieces, echoes, of some of his earlier fragrances: Amouage Jubilation XXV, Comme des Garçons Sequoia, and L’Artisan Dzongkha. Baume du Doge has good lasting power and respectable (non-intrusive) sillage; it’s available in 100 ml Eau de Toilette ($130). For buying information, see the listing for Eau d’Italie under Perfume Houses. Note: image at top left shows the coat of arms of Andrea Vendramin, Doge of Venice, and is via wikimedia. What a great article, Kevin! It makes me wanna visit Venice too! This one went on my to-try list. It sounds almost more Vatican than Venice (although I should talk – I've never been to either place) but it also sounds pretty yummy. My Mom had a friend living in Venice -she was up to her ankles in water in the kitchen all the time but she still loved it. Thanks, Iris. I'd LOVE to be in Venice for a light snow…. I have a sample of this and have been putting off trying it but you have emboldened me. And good for you not giving in to the spoilsports about Venice. Every place always used to be better if you've already been there — bah, humbug! Tama: I'd imagine a Vatican fragrance as being much 'colder' than BdD…maybe an Eau d'Italie Vatican scent will be forthcoming? I found it very nice on a paper strip, but on skin it seemed to decompose into something acrid and a bit nauseating, the pale child (not so much loved) of serge noire and fendi theorema. But as a Duchaufour's admirer, I'm sure I'll give it another chance in the next months. I am glad you loved Venice. I loved it, too! An early morning vaporetto ride is one of the highlights of my travels. Oh, yummy! I am so happy it worked out for you! And re Venice (and traveling in general) — what a buncha killjoys. I spent three days in Venice basically tromping around cheerfully without a map, deliberately trying to get as lost as I could (it's a small island, how bad can it get?) People who roll their eyes at Venice are jaded. I loved watching the Piazza San Marco flood. delfina: you're welcome…hope your re-try is better than you initial one. monkeytoe: yes, and it's such a QUIET city…love it. every time I tell people that I'm going to Hamburg they tell me to go to Venice instead. My sister is going with me, but she's already been to Venice so she wants to go to Amsterdam instead. I can relate to the first paragraph of this review. This has most of my favorite notes, I might try it. Wow Dachaufour is cranking them out, isn't he? I was worried this might smell too much like the Aedes scent he did for L'Artisan, but after reading your description it sounds different and delicious. Yum! I will now go ahead and try it. The 'dry cinnamon' in your review set off my inner 'note alarm'! Go Team Cinnamon! Sounds delicious — I wish they'd do a smaller size, but I'll definitely have to get a decant (for some reason, chatter I've seen about it up till now has seemed only lukewarm). Venice is absolutely amazing — I don't care what anyone says. I'd sooner be there or Barcelona any day over Paris. Kevin, your reviews make me DROOL. In a good way. krokodilgena: hope you like it. Mike: I love the Aedes scent too…think you may like this one too. Joe: I wish Eau d'Italie would do a little set for Christmas…four or five of the scents in 25 ml sprays! We can dream…. Kevin, what a wonderful piece of writing! Venice happens to be my favorite city in the world, and three out of the five times I was there it flooded… which makes it even more magical. This last time a handsome stranger swooped me up & deposited me on dry ground before I even knew what was happening. Venice truly is a city that promises all sorts of possibilities! I am also a fan of Baume du Doge, and had the good fortune to be introduced to it by the couple behind the Eau d'Italie line, Marina & Sebastien, when they spent time with our Sniffapalooza group in Florence this past July. It was very hot, and the spices of Baume du Doge really bloomed in the heat. I can't wait to wear it at holiday time – it feels festive to me – I think it's going to be my Thanksgiving scent. Now, if I could only celebrate Thanksgiving in Venice… that would be perfection. Agreed, agreed. I'm crazy for Paestum Rose – onward to trying out more of this line. Amazing review, Kevin! Liongirl: the entire holiday season in Venice would be great…and lucky you, to meet Eau d'Italie couple. You're such a good writer! You really make me want to go to Venice and also try the perfume. Thanks for sharing. How marvelous you make this sound. I recall the Posse did not like it (not sure if it was March or Patty) but now I know I must have a sample. The name alone is stirring, somehow. And Venice sounds sublime, no less because it is quiet – I would not have expected that. Perhaps someday I will get to go too. Exist: sublime, yes!…without the sounds of cars or Vespas…just boats and foot steps. Odd how many Italian firms persist in using French names for their perfumes. Why Baume du Doge instead of Balsamo del Doge? I delayed visiting Venice for many years because I was totally freaked by that film “Don't Look Now”. When I plucked up the courage to go I fell in love with it. I was lucky enough to go again this past summer but I much prefer it in the winter when the fog muffles footsteps and makes it even more atmospheric! Great excuse to keep dropping into nice bars for coffee or prosecco anyway. As for BdD, it sounds worthy of a sample at the very least. Love a good proportion of M. Duchaufour's scents and I'm sure your review did this justice. Thank you. What a mouth-watering review. Your writing is so sensuous and precise. I've never tried anything from this line but I am a rose freak and have wanted to try Paestum Rose now for ages. This scent sounds like it might be WONDERFUL on a man. I always feel in a good mood after reading your wonderful reviews Kevin. I just checked and discovered that I never ever smelled even one of Bertrand Duchaufour's perfumes..not one ! From your description of Baume du Doge I just KNOW that I will really LOVE BdD. Must see if I can get a sample. Venice…. I love Venice, it is a unique city so full of life and joy and beauty and mystery. Venice is a city where over centuries and centuries people from far away places came to visit and do business. Venetians are used to foreigners and they have this welcoming open attitude. I love it there. Wordsmith: Italian would be nice for a change! donanicola: foggy Venice is lovely…and a chilly day REQUIRES an espresso an hour! Marianne: NO B.D. scents? Then you're in for a treat…enjoy. elinoraddict: Paestum Rose works well on a man too…thanks to the great “incense-y” notes and Baume is firmly unisex. People have been saying how much better Venice used to be and what a pointless tourist trap it is since the Middle Ages. Seriously. It's still worth seeing, and I'm glad I did before it crumbles apart completely; but I'm also glad we just spent the day there. It is ridiculously expensive and there are plenty of other old cities in northeastern Italy that are much less hard on the wallet, and just as well worth visiting. romaayden: Thanks…and I do think BdD smells different (spicier,with a nice benzoin finish) than the Aedes scent…so worth a sniff for sure. Lucky you, living near Aedes and MUCH closer to Venice than me too! I wonder if the Doges (Dogi?) of Venice ate pan forte from Tuscany? 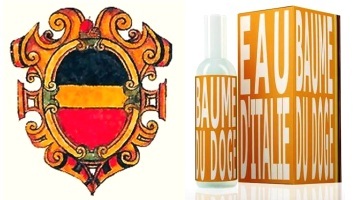 Baume de Doge reminds me very much of that dense, chewy cake made from honey, orange peel and spices. Like pan forte, Baume du Doge seems to me to be too rich for every day consumption. But I think just a bit of BdD could be quite wonderful over the winter holidays, sitting by the fire with friends and family, casting off the cold and dark with some biscotti and vin santo. And maybe some pan forte, too. Kathryn: it does have a wintry/holiday/special vibe about it, but on me it's not too rich at all. I love your review Kevin and I adore Bertrand Duchaufour. This sounds like a must try. It does sound a great deal warmer and more opulent than his drier Timbuktuand even Dzongkha. He is a true artist and a favorite of mine. Nice review, Kevin. I've been to Venice as well and enjoyed it. Also, like yourself, co-workers and other acquintances (not so much my actual friends) will say negative things about my vacay choices. In most cases, they haven't been to the destination. It's incredibly rude, I think. I once had a co-worker who said to me after someone told her I was going to Paris: “You're going to Paris alone? How awful! Good for you! I always wonder why it's such a big deal for folks to have a friend to do things with. I travel on my own all the time, and it's no big deal. I rather like it actually. Mmmmm, orange? Spices? Sounds delicious! I always loved pomanders as a kid, so this would totally be up my alley. I LOVED Venice. During the time I was there I kept thinking, “I'm in the middle of a fairy tale, someone pinch me!”. Patty: I'm liking BdD the more I wear it…pomanders in a fragrant wooden chest sounds good. Hello K. Hope all is well. I've been sitting with a sample of this for some time now and I finally put it on tonight. I LOVE IT! I’m really excited about trying this line……i keep plannign to visit Liberty’s in London, but never do…….i just ordered 8mls of Sienne L’Hiver from TPC on special offer, so fingers crossed I like it…….i enjoy rich fragrances, and this line sounds right up my street. Paestum Rose in particualr i’m looking forward to. Blimunda: it’s a great line…let me know what you think when you get your samples….